The Bay Area’s most Family Friendly Ballet. All ages are always welcome to our heart-warming and energetic performance of The Nutcracker. Our show features beautiful sets and a cast of well over 100 dancers including professional guest artists in the lead roles of Sugar Plum and Cavalier, as well as Snow Pas and Arabian. 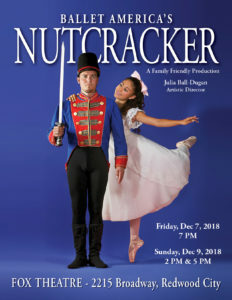 So why travel to SF and fight parking and high ticket prices when your whole family can enjoy a first rate production of this ballet favorite right here in Redwood City? You’ll enjoy easy parking and a festive holiday atmosphere at the historic Fox Theatre. Make a new Family Tradition! is the performance company of the Academy of American Ballet. Organized as a 501(c) non-profit your donations allow us to bring our performances to the community and introduce dance to economically challenged youth through our scholarship program. Your donations are tax deductible and greatly appreciated. Thank You!